with a cloud of ink. did she see floating by?" It is a while before Agnes hears from Andrew again. 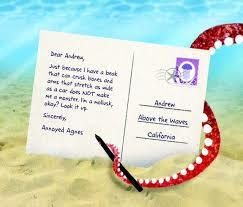 In the meantime, she does receive postcards from denizens of the deep who have opinions and observations to share. Another younger octopus is rude and up for a fight. A crab is happy to have avoided her arms and suckers. Then, there is another from Andrew that furthers annoys. Her second response sets them on a new path. Others postcards are written to her eggs, to her babies, and to the world at large. 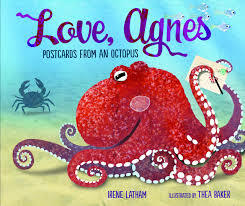 Through it all, we learn a great deal about the octopus in an ingenious, informative text that is written alongside the set of postcards. There are clear facts provided concerning the care she provides for her eggs, the changes in her own being as time passes and she awaits the hatching and quick departure of all those babies, and her own gentle demise. Collage, acrylic paint, and digital illustrations by Thea Baker are filled with the colors of the deep, and are textural and attractive. Children will want to pore over them to be sure they miss nothing about this amazing creature. Backmatter provides engaging facts and offers a list of books for further reading. 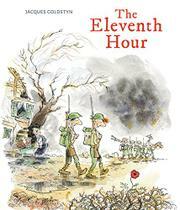 This book is one that I classify as faction with young readers: it contains both facts and story. It is also wise in the ways of the world, and a celebration of life! What a gift at Christmas for a reader who loves learning new information mixed with a well-told story, humor, and told in a way that is new and refreshing! Checks a lot of boxes, doesn't it? to be line leader this week. 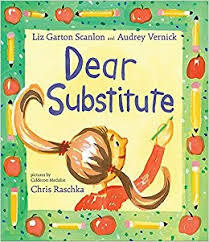 Poor substitutes! It's not an easy pursuit. In the early grades, little ones miss their teacher. Then, they miss routines that make their days easier and more familiar. In older grades, students often do their best to give the 'sub' a go! This would be a perfect book for a substitute teacher to carry in a bookbag to be read at the beginning of every new assignment. The first letter is directed at the person who replaces Mrs. Giordano. Wow. This is a surprise. and why didn't she warn us?" There are sixteen short letters her; the first to the substitute herself and the final one to Mrs. Giordano. 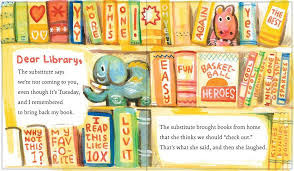 The rest are written to the varied events that take place during the school day, including a library visit, the school pet, lunch, and story time. Each is written to show readers how much things are disrupted with someone new is in charge of a classroom. The day certainly seems catawuimpus. As he does, Chris Raschka uses watercolor and gouache to create his colorful, detailed artwork. His borders and humorous images add charm and interest, and are sure to hold attention. Poor turtle waiting for a clean tank! Lovely world of poetry and imagination! And, I love the spread that shows Miss Pelly with her special powers. Now you care about rules? How did you even see us swapping? people being allergic to things. I was just thinking about Connor's yummy chips." 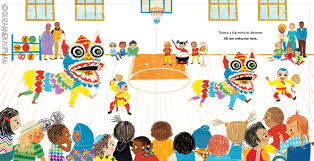 Using humor and understanding, the authors pen a story that might just help little ones understand that changes can be welcome, if we look with a new perspective. For those who spend their days being the 'chaos' in classrooms, you might add the following books to your repertoire (along with a book of fun poetry). Good luck and happy days! Miss Nelson is Missing (Allard, 2003), and Here Comes Teacher Cat (Underwood, 2017). As happens in real life, you don't have to love the same things to be friends. As happens so often with children, they easily accommodate how to navigate their differences ... especially when left to their own devices. Ann Stott has written a simple, and important, story focusing on two children who play happily together by compromising and finding comfort in each other's company. Both have a love for toys that are very different. Their decision to assure both are incorporated into their play is heartwarming and a testament to the imagination. In the end, nothing matters more than a shared love for ice cream. Satisfied, and satisfying. I must admit I got this book because I am such a fan of Bob Graham's work. 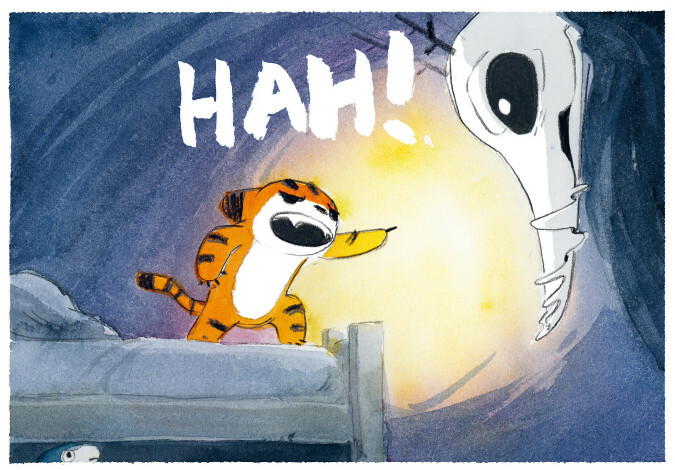 He is able to make this lovely story even more so with his brilliantly detailed artwork. Every image plays an important role to the importance of the story being told. 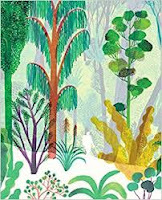 The gorgeous endpapers provide a perfect start - and finish. In between, he offers an autumn morning filled with action and life. It is a neighborhood brimming with activity, and people, and their pursuits. The two have created a book worthy of sharing, and then rereading. snow to seal it shut. gave birth to two bear cubs." Once her cubs are born, Mama Bear turns to the task of keeping them snug, answering their questions and assuring them about their future. The cubs are impatient to know what life will be like for them outside after the long, cold winter. She is endlessly patient, and full of wisdom to help them understand the changes they will face when spring arrives with warmth and sunshine. As they wait, she encourages them with her brave and warm responses. She teaches lessons about living good lives, about their world and the changing of the seasons, and all those things they will need to know if they are going to live independently. She passes her knowledge along, knowing that her cubs will need it when they move out into the world. "Will you stay with us always?" they asked. on your own," said Mama Bear. For now, they are 'snug' with their mother ... and safe. In an author's note, Chitra Soundar further describes the polar bear, and reminds her readers that each of us can contribute to the good health of this world we live in by taking only what we need from it. The beautiful and intricate designs are inspired by the Indian heritage of the two collaborators who bring their story to little ones. 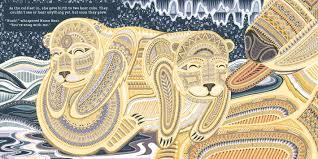 There is so much rhythm in the lines, swirls, stars, and backgrounds that adorn its double page spreads. Readers will be in awe of the detailed presentation. So. 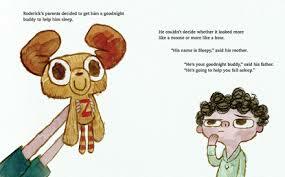 grab a blanket, bring a cup of hot chocolate and snuggle up before bed for a family read. 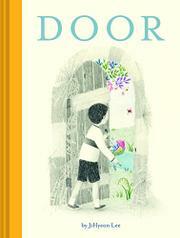 Reassuring and full of wonder, this is a really lovely book. Be sure to check for its companion - You're Safe With Me (Lantana, 2018). 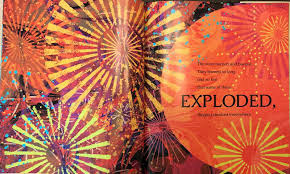 What a gorgeous book this is ... it is a harmony of carefully chosen and captivating poetic words complemented by spectacular 'hand-marbled paper and collage assembled digitally' artwork by the remarkable Ekua Holmes. One cannot help spending time reading and rereading, while thoroughly examining every detail of the amazing double page spreads. It is a book that will find fans of every age. The author helps her readers take a close look at the Big Bang and the creation of our universe. It begins in the deep darkness of space which held nothing but a single speck. Only one planet is near enough to its closest star to be not too hot and not too cold to sustain life. 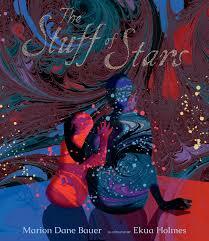 As time passes life forms are born and die, until the reader arrives from its own 'stuff of stars'. that were once salty seas. once the carbon in a leaf." We are all made of the 'stuff of stars'. This celebration of the universe, our Earth, and humanity is a remarkable achievement, graced with artwork that cannot accurately be described by me. The beauty Ms. Holmes creates needs to be seen. 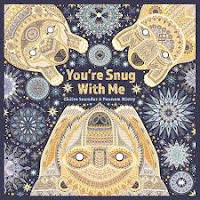 This is a magical book, and deserves a place in all libraries and on bookshelves everywhere. "Omu thought for a moment. to share. "Would you like some?" pot for her her nice evening meal." I love stories of community! Goodness knows, we need them now. Everyone in the neighborhood loves Omu, and she loves them back. 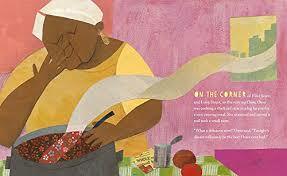 The smell of her 'thick red stew in a big fat pot' is all the incentive they need today to stop by for a visit. Do you think they are all hoping for the same thing? Omu is happily reading while her stew simmers. The scent of it cannot be contained within her apartment walls. Her first visitor is a little boy. - and he's intrigued by the delicious smell. She shares some stew. It turns out that he is not the only one who wants a taste.. A police officer is next; then, the hot dog vendor, and more and more people from the neighborhood. Omu shares with each visitor until there is nothing left for her own evening meal. No matter! She has grand and giving community friends who appreciate her kind and generous nature, and have learned another lovely lesson in generosity. Though her pot was empty, her heart 'was full of happiness and love'. Isn't that the way it should be? This is a splendid debut for Oge Mora. 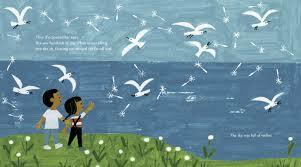 The text has rhythm and a structure that will encourage shared reading, and a return to the book for another go. The collage illustrations were created using 'acrylic paint, china markers, pastels, patterned paper, and old-book clippings.' 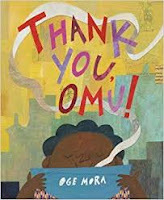 They are filled with expression and diversity in detailed spreads sure to please young readers and encourage discussion concerning Omu's kind and giving heart. We all want to see more kindness in this world. Books like Thank You, Omu will make a difference! FYI: Omu is pronounced Ah-moo, the Igbo word for queen. a figure eight is the final sign. WE KNOW WHERE TO GO!" As the world struggles to know what is happening to the honeybee, it's important to be cognizant of their plight and find ways to make sure we better support their well-being, and our future. 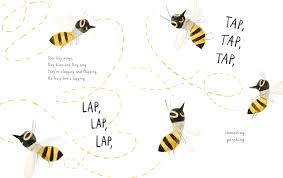 Ms. Hall wants her readers to know how bees manage to do the work they do, how hard they work, and the great value their bring to our lives. The honeybee makes its way to the beauty of a floral meadow where it is first heard, then seen. It chooses the perfect flower for this visit and begins its work of the day. "This is the flower the bee has chosen. This is the flower the pollen grows in. its sweet blooming scent calls the bee from its flight." The work of gathering nectar begins with a long, satisfying sip. Then, it's off to find another flower, and then another. Once full, it returns to the hive where a dance ensues that tells the next bee swarm where to go to do its own work. While the second wave is gone, the returnees fill the honeycomb with all they have gathered. Ah, sweet honey is capped and sealed, awaiting a hungry day when it will provide sustenance. Winter's arrival is an occasion for rest. A test it is, but spring eventually stirs the meadow creatures to a new awakening and a renewal of life. The bees begin again in earnest to find the flowers, drink the nectar, and produce the honey. 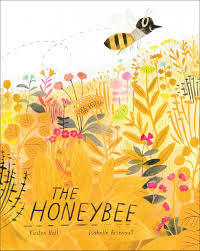 The beautiful golden colors that permeate its pages and enhance the rhythmic, accessible language inspire warmth and comfort through mixed-media illustrations by the exceptional Isabelle Arsenault. She helps readers understand the bee's work and the need to protect these tiny, invaluable creatures. A note from the author following the text provides further information and an appeal to help maintain and care for the amazing honeybee. If we want to keep putting honey on our toast in the morning, we need to do our best to ensure the bees have what they need to do their work. Charming, and just right for reading aloud to your kids. "I can almost hear you saying, “But aren’t beavers just lumpy rodents with buck teeth and funny flat tails?” Yes, they are! And believe it or not, those buck teeth and funny flat tails are just a few of the things that make beavers extraordinary." 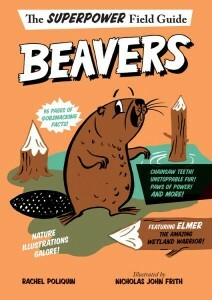 If you thought that you didn't want to know anything about beavers, this fascinating and funny new book will surely change your mind! It is so much fun to spend the time given to learning as much as Rachel Poliquin is willing to contribute to our learning. Elmer and Irma are life partners, having been together for six years already. The author sees them as real 'superheroes" and is more than happy to offer up compelling reasons when considering the superpowers that make them so. Ms. Poliquin then goes on to describe each of these superpowers in the most interesting, instructive and inspiring way. The text is chatty, and accessible for its target audience. There are quizzes throughout meant to test the reader's memory and absorption of pertinent facts. Nicholas John Frith adds humor and delight with his illustrations done is black ink, pencil and wax crayon on paper (with digital color). "A family of beavers can make a small dam overnight. But if you give beavers time, they can make a dam that's visible from space! It's true - the biggest beaver dam on record is 2, 800 feet (850 meters) long. It's in Wood Buffalo National Park in northern Alberta, Canada. If you flipped that dam upright, it would stand as tall as the Great Pyramid of Giza stacked on top of the Eiffel Tower stacked on top of the Empire State Building!" Bet you didn't know that, did you? There is a glossary in back matter, and a helpful bibliography for those wanting to learn more. This is the first book in a planned middle-grade nonfiction Superhero Field Guides series. Full of the facts, and humorous as all get-out, it will have many fans. If it is any indication of what we might expect in the future, bring on MOLES (scheduled for publication in June 2019). It is a welcome trip made by a young girl from America to her aunt's home in sunny Haiti. Though her mother and Auntie Luce have made different choices concerning where they will make their homes, the trip keeps the daughter/niece connected to their homeland and the beauty of it. On one trip, when the child was only 7, her aunt painted her portrait. It now sits on a shelf in her mother's bedroom. Ready to leave, the child thinks back on that time when Auntie Luce painted her. Her mother is sure she was too young to remember it. The child insists she was not; in fact, she remembers every detail of that trip. This is her story of that most memorable time. She feels the warmth, hears the sounds, sees the brilliant color of the island. 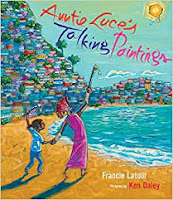 She loves to think about her aunt's other remarkable paintings that speak to the vibrant island life, its history, and its heroes. The walls in her aunt's studio are resplendent with artwork that reflects the beauty of the island, the struggle for independence it endured and the joy her aunt finds in representing it through her art. brightest ones, and all the colors in between." As the child sits for that first portrait, she worries that she does not feel a strong connection to being from America or from Haiti. Her dear aunt helps her understand that she is a part of both, though she does not make her home on the island. The incredible artwork, done in acrylic on illustration board, would make anyone want to take her same winter trip to see, smell, feel and be moved by the extraordinary colors and scenes from the island. The images add depth and context to this celebration of Haiti's history and culture. 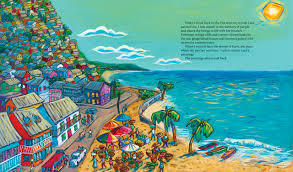 An enlightening author’s note tells readers about the Haitian revolution and the importance of never forgetting the past. my shoes right through, ma'am. Oh, what a lovely and inventive tale this is. Eleanor Sue is one blessed little girl. She has a marvelous imagination and a patient, willing mother. That mother is fully involved in every bit of fun her little one can dream up. Eleanor Sue has a bedroom filled with perfect pickings for a girl who loves to play dress-up - a shelf full of bonnets and hats, a long line of shoes of all types, a trunk just begging to be opened and a wardrobe to store everything else she might need. Our first glimpse of her favorite Saturday past time shows her in a green dress with shoes to match, and all of the accoutrements needed to create a puffy bouffant hairstyle. Eleanor Sue is pretty impressed with herself. Out the window she goes and straight to the front door where she is welcomed by her mother. She introduces herself as the new neighbor, with gift in hand. Invited in for tea, she regales her mother with a humorous answer to an innocent question about settling into the neighborhood. bathtub, and my eyebrows hurt." Offering thanks for the visit, Mom ushers her guest out the door. A while later, a witch appears there, and so their day goes. Eleanor Sue visits in a variety of costumes, her mother provides welcome, patience, interest and encouragement. Each visit provides a clue to the next guest. At last, the neighbor's lost cat arrives and sets Mom on a hilarious attempt to catch her daughter at her own game. Eleanor Sue will not be thwarted. When the cat is sent home and the door is closed, Mom turns the tables. Eleanor Sue changes one last time, and must then answer the doorbell when no one else is there to do it. Imagine her surprise when her dressed-alike mother greets her! The final spread is just perfect - as is the whole story! Creative, full of love and joy, I look forward to reading it to others. It is bound for my 'keepers' shelf to be read to Sicily and Chelsea when they next visit. Josie is not accustomed to coming in last at much. So, being the last to lose a tooth is not sitting well with her. Josie and her friend Richard are pretty competitive with each other. He tells his stories of tooth loss, as do the other children in the class. Josie wants to be like them. But, she is concerned. What if she never loses a tooth? Her efforts to lose just one tooth lead to so some pretty hilarious though conventional antics. Richard does his best to help Josie forget her worries. 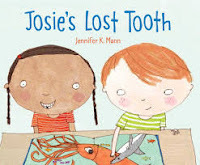 They are in the midst of an ambitious game of chase between a shark and a squid when Josie falls face first to the ground and her tooth pops out. The trouble is that the two cannot find it anywhere. No tooth ... no tooth fairy. Maybe a letter to the tooth fairy explaining what happened will result in a coin for that missing tooth. What will the tooth fairy think of that? Ms. Mann proves herself adept once again at truly understanding children and their unique personalities. The way they talk with each other, the accessible text, the appealing childlike illustrations all make this a story that little ones will find most enjoyable. The letters back and forth offer incentive for readers to try some letter writing of their own. 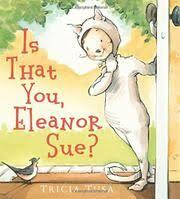 Teachers and parents are always on the lookout for a book that speaks to certain special concerns in a child's life. This one hits the spot! Little ones love books that help them with new learning, and that provide a guessing game for them as they go. 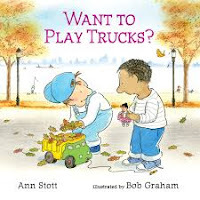 This entertaining book helps them with both of those interests. The pattern is set early with the question on the front cover. Bunnies in their hutches do. Chickens in the henhouse too. Gorillas eat a different color when choosing their foods. And so the book goes. 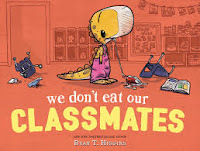 Providing 'food for thought' for the little ones who will share it. 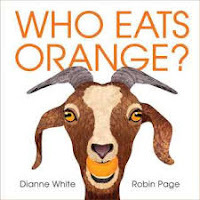 Soon, they will be reading along and letting others know all they have learned about colors, about animals who choose food by color, and about the foods themselves. Fun, indeed. appealing. Their bright eyes invite close observation and give a playful feel to the book. The final question involves the reader and the fact that they eat all colors when choosing their foods! Back matter provides further information about the habitats visited, the animals presented and the foods they consume. Fun, and full of information. looking at her that way? water fountain in the hall." Anna speaks for me when visiting art galleries. It can be a chore and a challenge. She and her mother are on an anticipated visit when Anna begins to display what are very natural behaviors for a young child. As she sits and waits for her mother to pay, she decides that she will have to make the best of it. Roaring at a lion is fun until the attendant requests quiet. Playing peek with a baby from behind a free-standing exhibit gets a 'Careful!' warning. A talk with her mother is the result of her antics. When she touches a painting and sets off an alarm, she is embarrassed and finds herself a quiet place to sit while her mother continues her tour. Knowing the little girl is in need of something special, the kind guard (who has been doing his job) provides a diversion not often initiated. He offers a peek at the work being done behind the scenes. Here, Anna finds art that speaks her language. She begins to recognize that art is a reflection of life ... and she finds inspiration in the rest of the art seen as they finish their tour. I read the text first and then went back to concentrate on the gorgeous reproductive artwork created by Lil Crump. Real life is explored on every page; visitors to the museum reflect much of what is found in the accompanying works of art. Humor is evident at every turn, the artist showing her audience real life reflected in the art pieces ... or the other way round. Connection is at the heart of this story and those connections are shown with joy and understanding. 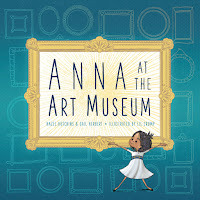 Anna is not the only child struggling to meet the expectations of the adults present, and that is encouraging and uplifting for those who might find a visit to the art museum difficult. Lovely! A much-appreciated key to the works displayed is provided in back matter. "I should be used to it. or make all kinds of offers. But I'm never used to it. And it always makes my hands shake. Always makes my throat tight." 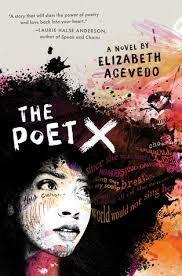 I really don't need to say much more than Elizabeth Acevedo just said about her brilliant debut ... but, I will! I don't want you to miss reading this important, powerful, meaningful and courageously written novel which just won the 2018 National Book Award for Young People's Literature. Lucky I am to share it with you. It is a book I read in the summer, and it continues to find its way into my heart and my head. It certainly does not speak to my own experience; rather, it informs, enlightens, and opens my heart to Xiomara Batista and the amazing young woman she is, and the many other young women she represents through her compelling, poetic voice. . Although a twin to Xavier, the two have little in common but their love for each other. X is tough, outspoken, and 'one who is ready for war' (as is the meaning of her given name). Her controlling parents wish it were not so. As she nears her confirmation in the Catholic church, she begins to ask questions - it is not a popular stance with her parents, her brother, or her best friend. She must constantly reject attention from her male peers and the older men in her neighborhood. She is intrigued by her lab partner Aman. His interest in X has little to do with how she looks. The two are attracted to one another, and keep it a secret. It is only through poetry that X is able to clearly express her thoughts, feelings, hopes and dreams. Readers will be drawn to her story through that poetry, and will feel the undeniable emotions she is able to share there. There is so much love - for her parents, her brother, her best friend and for Aman. Her story is also awash with misunderstanding, secrets, rebellion, a growing sense of self. A teacher's invitation to join the poetry club is enticing, but fraught with difficulty. If she joins, without her mother's approval, will she ever be able to share the poems that speak to her heart and who she really is. Ms. Galiano asks me to read her something new. I know I need to pick the best and shortest pieces in advance. to slow down, to breathe, to pace myself, to show emotion. Ms. Galiano tells me I'm really blossoming." Brilliant, forceful, heartbreaking, and full of impact on every page, you should read this book and then share it with others. "Carmela followed as he cut back into the street at Freedom Boulevard, past the crowded bus stop and fenced-off repair shop, past the old folks' home where two hunched old women waved smiles, past the huge home improvement store where her dad used to stand around weekend mornings, waiting for work." It's a pretty important day for Carmela, as birthdays are for most small children. Because she is now old enough, Carmela is allowed to go with her brother as he runs his errands for the day! 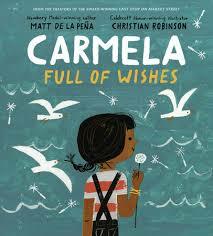 They venture out together; Carmela is proud and happy, her brother does not feel the same way. Still, she perseveres and follows him through their neighborhood. Seeing a single dandelion growing up through a crack in the sidewalk Carmela picks it up and prepares to blow its showy seeds into the world. Her brother is quick to make her feel silly. "Did you even make a wish? You're supposed to make a wish. Everyone knows that." "Of course I made a wish," she told him. But it was a lie. Carmela didn't know." she spent all day making for fancy guests. so he could finally come home." The flower is even more important when she internally voices those wishes - until she falls, and the dandelion lies crumpled on the sidewalk. With love and compassion, her brother comes to her rescue. Only then do they head home again. As they did so beautifully in Last Stop on Market Street (G. P. Putnam's, 2015), these exceptional artists create another perfect story to cherish and share. 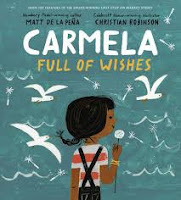 Matt De La Pena's sensitive and meaningful words are accompanied by Christian Robinson's superbly constructed scenes of Carmela's community 'using acrylic paint, collage, and a bit of digital manipulation'. The result is increible! An antique key, a tiny flying bug, and an inquisitive boy - all that is needed to begin a journey. Walls and doors hold special appeal for most of us; for little ones, who have few fears, they are an invitation to experience something brand new. The boy in this book does exactly what we might expect of him. Key in hand, he walks through a drab and colorless world, awash with apprehensive, gloomy people. The door looks unused, with numerous spider webs providing cover. Not to be deterred, the boy walks through it and into a world of ever-increasing color - and welcome. As he walks and meets the inhabitants of this unfamiliar world, he begins to smile. There is great variety in their appearance and he has no knowledge of the language they speak. He knows only that he is happy and comforted. As he wanders, he is greeted with friendly smiles. The creatures' company is refreshing. He happily follows where they lead - from swings to tree branches, and finally to an open space with a collection of many doors that lead to new adventures. One of the doors opens to a wedding, and the party that follows: a delicious feast, some dancing and a group photograph. Finally, the key he does not know he lost is returned. The time to leave this fantasy world has come. But, why close and lock the door? As she did in her earlier book, Pool (Chronicle, 2015), Ms. Lee creates a world of imagination and good will. 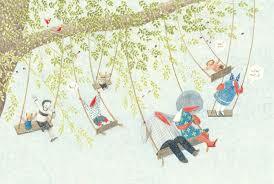 The illustrations, in pencil, are full of fun, innocence, magic, and understanding. It is worth celebrating. Olive enjoys her friendships, and she has many at school, in the neighborhood, and on the bus. 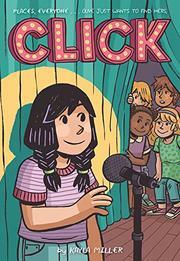 When an announcement concerning the fifth grade variety show leaves her without a partner, she begins to worry. Everyone else has a part to play in the show; she does not. Did they not want to be with them? Her mother notices her sadness and asks about it. for the school variety show. None of the kids from your class? The kids from the neighborhood. Your friends on the bus? The girls you sit with at lunch? Her mother has a suggestion; it is not acceptable to Olive. Instead, she begins to wonder about her place in the world. She has nightmares, is anxious, talks with her aunt who offers advice and is grouchy with her family. She doesn't want to ask to be part of an already formed group. It takes some introspection and a serendipitous sleepover with her aunt to help her decide what her part in the show could be. As her friends offer her a place with them, she remains confident that she has found the perfect role. Recognizing that her friends had no intention of leaving her out on purpose gives her even more confidence. The night of the show she proves she made the right decision. 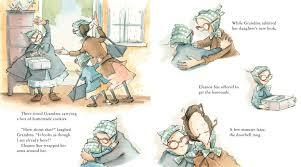 Ms. Miller's artwork extends the premise of her story, and makes it easily accessible for readers from 9 to 12. Emotional and telling, she accurately portrays fifth graders as they attempt to come to terms with issues at school, in families and for their future. The title is grand, the action engaging, and the story sure to find favor with many readers. develop a curious habit. " What an absolutely gorgeous book this is! Not only that, it has a message that is mysterious and slightly puzzling. The beauty of the design from its Mylar encased, boldly colored front cover to its final blank white page is worthy of attention and praise. The text is essential, while sparse. if you look straight ahead, but the sides are boundless. As the reader travels through the forest it becomes ever more difficult. On alternating embossed pages, the observant reader will note that the human image is ever-changing, and a peep-hole invitation to move forward, despite any concern. The face matures and changes as the story continues. It is a story told with emotion, and it invites additional opportunities to share ideas and opinions through ongoing discussion. Each time it is read, it adds more meaning and then encourages another visit. The pattern is evident, and the growth and depletion of the forest as well. So much happens from that small grove of trees, through the verdant abundance of forest life, to the lack of life seen anywhere in the forest. In the final white spread, readers are unable to find a discernible human presence. Then, as nature is wont to do, there is regrowth. Ah, the mystery of life and death. support for the project by the citizens of Asheville. We connect with homeowners on a daily basis. We hear their personal bear stories, answer their questions about the animal ... (Nick Gould)." As I so often have been, I was amazed to read this book and discover the goings-on in Asheville, North Carolina. What a study it is and how wonderful that many of the residents are living peacefully side by side with a growing black bear population! The leader of the group of scientists studying the bears is Colleen Olfenbuttel. She is a biologist and professor at N.C. State University. The team does what field teams are tasked with doing - capturing and tagging the bears so they can keep a close watch on them. Many have been fitted with radio collars which help to follow them. 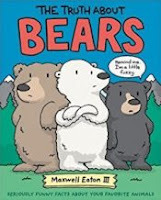 The author, a resident of Asheville, shares a personal and warmhearted view for her audience, as she writes about the scientists and the bears themselves. She accompanies the team on two up-close-and-personal encounters with bears. Many of the full-color photos are the work of a local wildlife photographer, Steve Atkins, adding another level of care and concern for some of the city's wild creatures. The photos allow readers to see the beauty of the landscape, where and how the bears live in backyards, and the many bears who make their homes there. 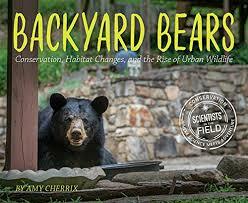 Ms. Cherrix offers much additional information regarding the life of the black bear itself. She writes about the way in which bears have become a part of the Asheville landscape as they adapt to habitat changes and the willingness of the human population to do their best to adapt themselves. She offers some advice on what to do should you encounter a bear. She also relates a list of places throughout the world where humans have learned to live with various animal species, including coyotes in the United States, feral chickens in Hawaii, boars in Berlin, and turkeys in Boston. better able to tolerate New England's harsh winters. up insect pests that bother people." They will love the information provided, as well as the silly statements meant to entertain and make them laugh. The author recognizes that children will get the humor, and recognize the real goods being shared. The pages are designed to grab attention, and they do so with great success. Early readers will have no difficulty reading the text provided. 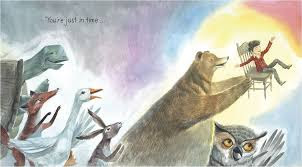 When they are not reading the amusing observances of the bears, they will learn about the variety in species, where they live, what they eat, how they behave and what makes them special in terns of adaptation. ears to protect them from the cold." 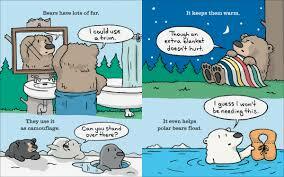 Meanwhile, the animals' conversations also offer up useful information while making readers giggle. The text boxes are clearly delineated so kids can see the real truth, and nothing but the truth. "Some bears sleep all winter. What happened to my pillow? 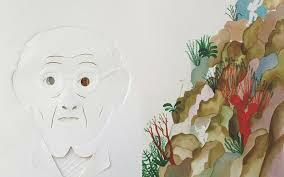 rocks and roots, in caves, and inside hollow trees." Back matter includes tips on bear safety, followed by a bear file. The file provides a list of habitats, a look at a set of tracks, field notes, a world map that shows where bears are found, and a list for further research. Other books in the series provide 'seriously funny facts' about Elephants, Hippos, Dolphins, and Crocodiles. 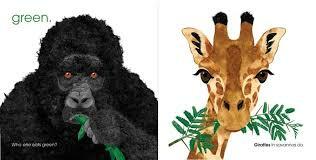 What terrific additions they will make to a classroom collection, or to the personal library of young kids who always want to know more about animals of the world. Speaking of turning the tables, or were we? 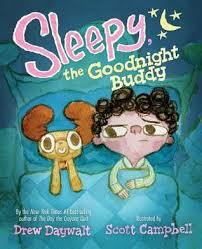 Just the same ... that is exactly what Sleepy does in this story about Roderick, a child who 'hated going to bed." He uses many excuses - you have likely heard every last one of them. His parents cannot figure how to make bedtime easier, so they buy him a stuffed toy in hopes that Sleepy will do the trick. Sleepy, with his eerie and unblinking eyes bewilders his new owner. "Roderick decided to hide Sleepy. he could FEEL Sleepy looking at him. tossed him into the closet." That's when he discovers that Sleepy has a voice. Readers will find Sleepy to be funny, and very sneaky - with his constant demands for water, the bathroom, brushing his teeth, a story or two. You see where we are going with this, right? In the end, Roderick is just too tired to continue complying with Sleepy's demands. Mission accomplished! With terrific dialogue and appealing text, this is a book that is going straight to my 'keepers' shelf. Cannot wait to share it! Scott Campbell ups the charm with his digitally enhanced watercolors that keep the humor and the many expressions up close and personal. Readers will get a real charge out of the relationship developed between Roderick and Sleepy, and the results when adding Sleepy to the bedtime routine. Now, here's a story of bravery that kids will appreciate and want to emulate. Tiger often lets her parents know about the monster that lives under her bed. In fact, she asks for food every day after supper to feed that monster. It has been there since Tiger was a baby; at that time, Monster decided it would not be fair to scare someone so small and new. Instead, Monster chose to chase away any nightmares that might appear. The two spend every evening in exactly the same manner. Tiger brings favorite foods, Monster eats, they play games together, Tiger goes to sleep, and Monster keeps watch through the night. All nightmares get their comeuppance from a brave and brash Monster. It works well, until Monster meets his match. A toothy, terrifying apparition with no fear, and Monster is unable to send it away. Instead, he sadly cowers under the bed. The next day Tiger remembers the nightmare, and must wait until bedtime to ask Monster what happened. "I had a nightmare last night. And you keep those away. But it does - and Tiger takes charge. Monster is impressed, and Tiger is elated. Bravo! This is a terrific graphic tale. Ms. Tetri uses deep blues and grays for the nighttime scenes, then switches to warm oranges and yellows for daytime action. The details are sure to capture attention. 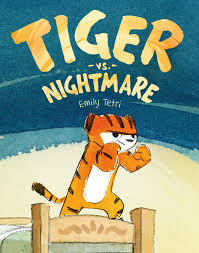 It is beautifully rendered to make this story a sure winner for children who love their books full of action and admiration. Brimming with heart and the joys of friendship, all readers will find much to admire here. "Mary is angry and unhappy at home, and she shows it. By the time she's fourteen, she has become a Big Problem. Her father sends her away to live with a family of strangers in Scotland. The family is kind. Mary likes them. As she wanders the barren hills, she can let her imagination roam free. But at sixteen, when she returns to her family, she is still a Big Problem. And what does she do next? She becomes an even Bigger Problem." It has been 200 years since a young girl with many difficult life experiences sat to write her first novel ... Frankenstein. The fact that it had to be published without the author's name was testament to the times. The works of women writers were not acknowledged. In fact, it wasn't until 5 years later, when a second edition was published, that Ms. Shelley was given full credit for her work. 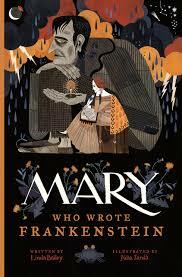 This has been a year for books about Mary Shelley, and I have posted a few. In this book, Linda Bailey aims attention at the events in Mary's life that led to her writing such a story. From the beginning, she was a 'dreamer'. She was a writer as well, and she wanted her stories to reflect the daydreaming that she did while wandering alone. Much of her time was spent at her mother's grave. Mary Wollstonecraft was herself a writer and a champion of women's rights. Her daughter wants to follow in her mother's footsteps. Unhappy at home, she elopes with Percy Bysshe Shelley, taking her sister Claire with them. Their life together is not an easy one. A meeting with Lord Byron leads to a conversation on a fearsome, stormy evening. A challenge to write a ghost story is put forward. The others in the group get to work; Mary takes some time to bring her monster to life. She is only 18, and about to embark on the most famous work of her life. Linda Bailey does a wonderful job of bringing Mary to her audience. Her writing is filled with fascinating detail and succinct text, which makes it very accessible. Julia Sarda's digital artwork is a perfect complement to the telling. She uses dark brooding tones to create a perfect mood for the story shared. It is a haunting, while also exciting, complement to Ms. Bailey's well-told tale. This is a terrific introduction to a writer whose first novel remains a perennial favorite. Though many of the children for whom it is written will not yet have read Shelley's work, they will have some knowledge of Frankenstein. Back matter adds a lengthy and pertinent author's note, as well as a list of sources used to write this worthwhile book. 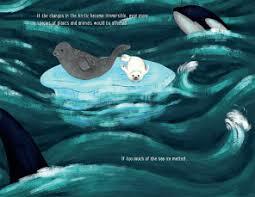 the melting of the sea ice ..."
We know the sea ice is melting. Do we know what would happen if polar bears disappeared? 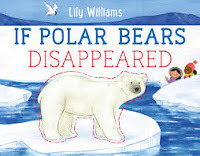 It is a question posed by Lily Williams in this new informational picture book, written as a companion to her earlier book, If Sharks Disappeared, (Roaring Brook, 2017). Should the sea ice continue to melt until polar bears can no longer exist in the Arctic environment they now inhabit, how would that loss affect the rest of that ecosystem and spread beyond it to the rest of the world? The more the ice melts, the more changes are seen in the Arctic. When there are no polar bears, the numbers among their prey would rise until the lack of ice also affected them in a more serious way. And so it goes, affecting plants and causing the animals in the food chain to seek new homes where adaptation is more difficult. Such patterns would change all ecosystems. Have you considered the full impact of the loss of polar bears? Scientists have and they are working tirelessly to discover ways to find solutions and to teach all of us the connections between ecosystems and the life they support around the world. A glossary, information about the Arctic and the impact climate change is having there, a list of things we all can do to help, an author's note, a bibliography for the research done and additional sources are included in backmatter. 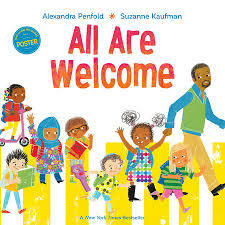 It is always time to celebrate diversity and to embrace the message of this book. In a school classroom, filled with a varied group of children from many cultures and with different abilities and interests, it is made clear that every single child is welcome. The endpapers are an invitation for observation and discussion. Here, a child may see a family similar to their own - a mom and dad walking with two little girls, a biracial couple pushing their child in a wheelchair, a pregnant mom walking with her son who's waving to the child behind them, a caregiver walking with a math whiz, a Muslim family, a little boy with his two dads, a little girl arriving in a cab driven by her father - what a joyful scene! Every glimpse into this classroom is filled with the joy of being together, of sharing experiences, of learning about the world, of enjoying music, reading, art, and of listening to stories. I found myself noting the shy children, the apprehensive parents, and I was always checking to learn more about each of the children by watching them throughout their day. What fun is that! "We're part of a community. These kids know we are all the same on the inside, and how we look on the outside or how we dress does not matter. It is a worthy way to look at this world we live in. Their personalities shine through, in artwork created with acrylic, ink, crayon, collage and Photoshop, as we follow them from page to page right up to the final gatefold which shows the school community gathering for a potluck dinner, while also celebrating the learning that is happening in the classroom. Don't miss the inside poster on the book's cover! 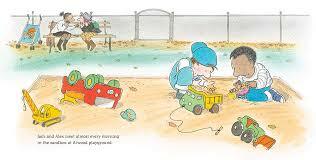 This emotional story is told of two boys who grow up together in the town where they are born. Jim is first, and Jules is two minutes late. They have much in common, with Jim always leading the way. It is no surprise that they enlist together when war is declared in Europe. They are some humorous moments for Jules while the two are in training. Their 'jubilant welcome' in Europe is quickly forgotten when they get to the front lines. of epic battles and glorious charges. surrounded by barbed wire instead." And it gets much worse. There is such dignity in Mr. Goldstyn's portrayal of loyalty, friendship, and war, and such sadness in portraying the realities of the conflict. The writing is direct and honest; the pencil and watercolor artwork is detailed and offers moments of humor, and others of total devastation. He tells a first-rate visual tale, start to finish. The Great War ended 100 years ago. Today, fighting rages on around the world. Reading it with older students today is sure to spark conversations concerning the current conflicts that bombard them in daily news reports. I wish I were working in a classroom today. It is a story full of impact, and needs to be read. critters get a move on? Lucky me! I have been reading a number of excellent animal information books recently, and have been happy to share them with you. Today I want to add this one to your list of books you will want to add to your classroom, school library, or for a child you know who loves animals and wants to know everything there is to know about them. These are not the animals often featured in the books we share with children. In fact, Melissa Stewart lets readers know that on the first page. someone paid attention to them?" You won't find elephants and cheetahs here. You might, however, find some truly fascinating and often unfamiliar creatures whose ability to adapt and thrive make them worthy of attention. Ms. Stewart begins with the 'pipsqueaks'. After introducing a few, she informs readers about a few of their ways to avoid capture by their enemies. 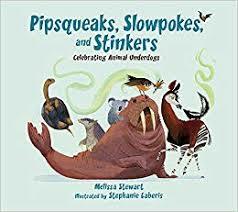 And she goes on to relate information about many creatures that have been able to adapt to their environment and ensure their place in the animal world. I appreciate her inclusion of her readers with the questions she asks to get them thinking critically. to the forest floor. Thud. once in a while than starve to death?" The text is personal, accessible, and spirited. That makes for a fun read while learning a great deal. The research, as always, is precise and admirable. The digital illustrations add humor, and match the tone and text perfectly. Backmatter offers further tidbits that add context for info already provided. Then readers are on their own to do some of their own research. A young boy, sitting all alone at a table where other boys sit - removed from his melancholy and loneliness. It's the same at night in a room filled with side-by-side dormitory beds, he is the only one awake. 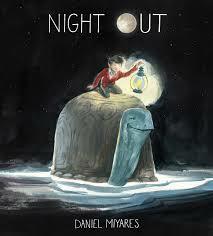 His face is swathed in moonlight; his pet turtle appears to be bent on escaping its bowl. Noticing with alarm the empty bowl, the boy is surprised to find an invitation leaning there. The message reads: "The honor of your presence is requested ... "
The full moon beckons him outdoors. Dressed, with his bicycle at the ready, he is off on an adventure that includes a long and winding path, a lantern, a bridge, and a familiar (if larger) friend. He climbs up on the turtle's back and they move forward with their journey. It leads to rejoicing with new animal friends, and ends with sunrise. The two (turtle included) scamper back into their bedroom. Feeling more confident now, he shares his dream with the other boys, and brings a heartwarming end to his feeling of being alone. The text is spare, leaving the extraordinary artwork to tell a visual story that contains many of the essential features of other folkloric tales. The imagination is a wonderful thing. This story is a search for a connection and is perfect at bedtime, or anytime. "She's a plant eater. And the small, fierce one is an Allosaurus. The Allosaurus can move very fast. 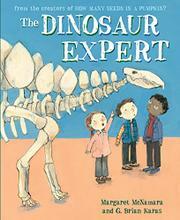 But the Barosaurus has a super-powerful tail," continued Kimmy. "She'd use it to protect her baby." "You know a lot about dinosaurs," said Jake. "I love fossils," Kimmy said. "I want to be a scientist when I grow up." "Girls aren't scientists," Jake said. And Kimmy stopped talking." This is the fourth book in the Mr. Tiffin series about his classroom and the experiences they share. Kimmy loves fossils and all there is to learn about them. She is especially fond of dinosaurs and has much to offer when the class goes on a trip to the museum. Kimmy is extremely knowledgeable and more than willing, in a very kind and fitting way, to tell her school mates what she has learned. Jake's unkind treatment and his assertion that 'girls aren't scientists' hurts Kimmy's feelings as one might expect. She makes the decision not to say anything more. If you have already met Mr. Tiffin, you will know that he is the kind of teacher all children should have at some point in their school life. He quickly realizes that something has gone wrong. He introduces Kimmy to an exhibit which displays the Gasparinisauria, a dinosaur named for famed paleontologist Zulma Nélida Brandoni de Gasparini. Jake is taken aback, but recognizes it as pretty amazing. Kimmy is thus encouraged to share everything else that is pertinent to their visit and the specimens they are seeing. She readily admits that she would like to follow in Ms. Gasparini's footsteps. Mr. Tiffin is certain she will do that. Brian Karas uses gouache, matte medium, and pencil on paper to create his signature artwork. The pages are filled with expressive, appealing characters and lively action. Dinosaur fans will be thrilled to see some of their favorite creatures up close and personal, and are likely to help Kimmy as she shares her expertise, by adding what they know as well. The endpapers are sure to garner attention, as will the two-page addition of a list of Kimmy's 'favorite paleontologists', beginning with Mary Anning and all female. This is a terrific addition to the series that includes: How Many Seeds in a Pumpkin? (2010), The Apple Orchard Riddle (2013) and A Poem in Your Pocket (2015). All are published by Penguin Random House, and worth a close look.